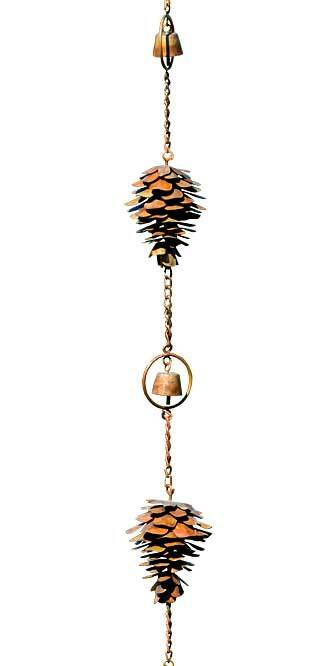 Bring evergreen style to a corner of your home with this Ancient Graffiti Pine Cones and Bells Rain Chain. Using this striking chain in place of a downspout lends a unique look to your home, as well as adds gentle sound to the setting. Seven intricate, metal pine cone shapes create a line, while bells within rings rest between them, and a chain connecting each element completes the piece. The wealth of brown hues meshes with the outdoors, and the flamed finish adds dimension. This chain is fantastic for helping direct rainwater from your gutter to the ground, taking the place of a downspout. An included gutter clip installs into the opening on your gutter, and a hook at the top of the chain allows you to suspend it easily. Its generous, 100" length fits on many different homes, and the chain links may also be removed for versatility. The metal body remains durable and beautiful for several seasons, while the pine cone motif celebrates nature. Stylishly direct rainwater using this Pine Cones and Bells Rain Chain.